Chaakyaar Koothu, performed by the members of the Chaakyaar community, is a play performed in temples at special halls called Koothambalam. The hall is connected to the temple. The term 'koothu' was adopted from the Sanskrit word Koordanam, meaning dance. Hence, Chaakyaar koothu, is a combination of dance and humor. This ancient form, unaware to anyone about its period of existence, consists of two parts- action and narration. The play consists of narrating Puranic stories by a Chaakyaar in a humorous manner. The action, earlier known as koothu, is of various types. When the stage consists of more than one member, the koothu is known as Koodiyattam, whereas when it is a one man show, it is called Chaakyaar koothu. Other types of koothu include Mantraangam koothu, Anguliiyaangam koothu, Parakkum koothu, Matta vilaasam koothu etc. The Chaakyaar is dressed in a pleated attire resembling a joker, with a usual mark on the forehead, known as pottu. The face is also adorned with soot and turmeric. One ear holds a huge earring called Kundalam, whereas the other ear bears betel leaves and geranium flowers as earring. A red cloth tied to the head, girdles and bangles also form a part of the costume. The procedure of the dance form is as follows. The Chaakyaar comes on to the stage, and offers his salutations. This is followed by a dance form called Chaari, which is an offering and cannot afford to carry any mistakes. Later, verses and prose are recited and their translations are put forth. Earlier a story telling process, the Chaakyaar pronounces each word slowly and in a special tone called Bharu method, which helps in attracting each and every member in the audience. The musical instruments that accompany the art form include Mizhaavu, Kuzhittaalam, Itaykka and Sankhu. Performed at the Koothambalam, it is constructed based on the sayings in bharatha Muni's Natyashastra. The hall consists of a green room which opens to the stage. The rest of the place is free for the audience to make them comfortable with. The Chaakyaar tribe, said to be ostracized from the Namboodiri Brahmin community, earns its livelihood by performing this art form. Koodiyaattam, probably the oldest dance-drama form in India, represents a joint action by the Chaakyaars and Nangyaars. Based on Sanskrit texts, similar to that of chaakyaar koothu, Koodiyaattam is presented at the Koothambalam and is a combination of drama, dance and abhinaya or expressions. Excluding the 4-day precatory day, it is performed at a stretch of 10 to 15 days, occupying 2 to 3 hours in each day. Revealing every potential of art and drama, this art form deals with various situations like humour, irony, serious thoughts on life's purposes etc. The performance is lighted with the sound of the drum by a Nangiyaar, and the recitation of the invocatory verse, known as vandana slokam by a woman. This is followed by a purificatory ceremony and a rest of orchestra. In the art form, all the four abhinayas or expressions are clearly seen. The emotional effects are brought in with graceful steps, elegant gestures and meaningful facial expressions. During the performance, instruments such as edakka, maddalam, conch, pipe and horn are also used. 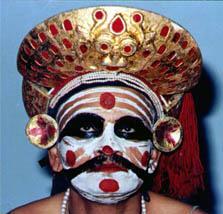 The attire of Koodiyaattam very well resembles that of Kathakali. However, the traditional costume depends on the role played by the Chaakyaar. The make-up consists of a background of paste of white rice on the face and hands, along with circular red marks on the forehead, cheeks, tip of nose, breast and fore-arms. Eyes elongated up to the ear and double moustache with ends raised and then lowered is also provided with. Flowers are stuck on one ear, and betel leaves are placed on the other ear. The difference between this form and Kathakali is that in this form, women are allowed to play the female roles, whereas in the other one, males themselves play the role of females. The Koothambalam is decorated using fruit bearing plaintains and bunches of tender cocunuts. One end of the stage includes a lit lamp, called nilavilakku with a vessel filled with paddy. Either on the other side or on the same end, a member of the Nangiyaar community plays the drum along with a woman who occasionally chants the verses. Believed to be conceived from Krishnanaattam, Kathakali is one of the most famous dance drama styles from Kerala. The graceful movements, elaborate expressions, charming costumes and make-up made from nature, makes it one of the most known art form in the world. Expressing all four expressions to the fullest, Kathakali involves a lot of hand gestures, known as mudras. With the help of the 64 hand poses, an entire literary expression is reduced to elementary notions. The song used for the performance depends on the theme depicted by the act, and the powerful music enlightens the moods of the actor adding to the acting. The make-up used for Kathakali is completely made out of herbal plants of the forest, and each colour depicts a particular emotion. While the green color represents godliness, white represents spirituality. Like in most art forms, red represents violence, black evil and yellow a unique combination of godliness and violence. A unique characteristic of the make-up of Kathakali is the reddening of the white of eye by putting in a few young seeds of chuunda puuv. The red eyes stand a contrast to the rest of the make-up on the face. Depending on the make-up and costume, the Kathakali characters are divided into five- Minukku, Paccha, Katti, Taadi and Kari. Taadi has three varieties Velupputaadi, Chuvannataadi and Karupputaadi. Minukku – In this form, the character is beautified using yellow and redgiving it a symbolic glow of holiness to a devotee character. Quite often the face is adorned with white or cream colour dots from the cheeks to the fore-head in a bow shape with painted eyes and eyelashes. Paccha- It represents a green coloured hero, God or the virtuous. The front part of the face is covered with a deep green paste on which white rice paste curves run from the centre of the chin, with black eyes and eyelashes and bright red lips. Katti- With a complicated make-up, this represents evil characters against the hero. Though the face paint resembles that of Paccha, the sides of the nose are painted red which rises up to the forehead above the eyebrows. Taadi (beard) - This make-up represents both godly and evil. To differentiate among them, three taadis are prevalent- Veluppu taadi or white beard, Chuvanna taadi or red beard and Karuppu taadi or black beard. While the white beard represents charcters such as Hanuman or other monkey sages and warriers, the red beard is done for the humorous characters. The black beard represents hunters and other robber chieftains. An expert in Kathakali would have gne through extensive training from an early age. This would include massages and oil-baths to enlighten the muscles, joints and nerves to make the body flexible and supple and control their behavior. Talking about the life and activities of Lord Krishna, this dance-drama is performed in a stretch of eight successive nights. The series of performances start from Vishnu taking the form of Krishna known as Avataaram, followed by Kaaliyamardana, the killing of the snake named Kaaliyan, the love games played by Krishna and Radha, Raasakreeda, the killing of Kamsan, Kamsavadham, marriage of Krishna and Radha, Swayamvaram, the war between Krishna and Baanan's guard Shiva, Baanayuddham, Vividhavadham, and the travel to heaven, Swargaarohanam. The art form is performed in a courtyard and the characters are beautified in a room close to the courtyard . The lighting includes a single traditional Kali Vilakku or oil lamp. The performers are completely pure, eating only vegetarian food. The person playing the character of Krishna can eat just one meal on the day of performance, while the person playing Lord Vishnu can eat just one snack food. Before entering the dressing room, the performers are purified by a bath. The costume differs between the male and female characters. Thebasic attire for male characters consists of a starched gathered petticoat, a gathered white skirt with orange and black horizontal stripes near the bottom, leather pads with attached bells to place below the knee, breast plate, one or more shawl with a mirror at each end, a headdress and ornaments for the chest, upper arms, wrists, ear and forehead. The characters are distinguished depending on their make-up, costume, design of headdress and weapon or other stage properties used. The basic attire for a female character includes a floor length skirt with red border, girdle and beads and ornaments for the arms, chest, ear and forehead. The headdress includes an item made of cotton covered with black cloth to resemble that of hair. Bells are wound around their ankles. The colour used for the make-up include blue made out of neelam, yellow from manayola and chaaillyam and cencillyam for red, black from soot and rice powder mixed with water for white. The combination of colors include an orange with more red than yellow called pazhuppu, orange with more yellow than red called minukku and a green shade with more yellow than blue called paccha. The performance is mesmerized with songs sung by the vocal trainees in the surroundings. A representative of the Christian community, it represents the journey of Maar Thoma all over India. The songs for Maargamkali are sung in three different ways- in a lengthy manner, in a shortened manner, a combination of lengthening and shortening the song. Initially performed only by men, their attire includes a simple gold bordered dhoti and turbans, with a red cloth as a waist band. However, since women also play this art form in recent days, ornaments is also used which include coin necklaces, the large traditional Christian earring, big broad bangles and large anklets. Their hands are reddened with Henna. Focusing on graceful body movements, twelve players bow in front of the lamp and start dancing around the lamp at a distance of three feet each. Also read: Top 10 Nature Resorts and Jungle Resorts in Wayanad. I like all the above but the best is kathakali..... All over world kathakal is most famous dance The graceful movements, elaborate expressions, charming costumes and make-up made from nature, makes it one of the most known art form in the world. Expressing all four expressions to the fullest, Kathakali involves a lot of hand gestures, known as mudras. Around 64 hand poses, an entire literary expression is reduced to elementary notions. The song used for the performance depends on the theme depicted by the act, and the powerful music enlightens the moods of the actor adding to the acting.